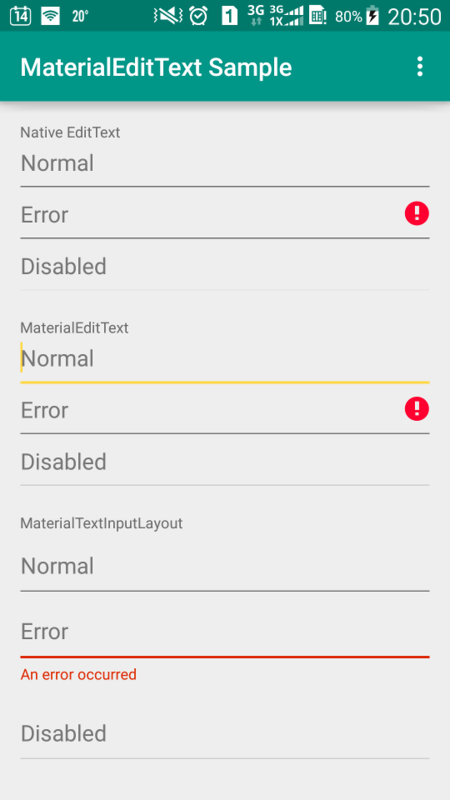 Material Design EditText with a delightful linear ripple in background, compatible with Android 4.0+. This library took the framework implementation of RippleDrawable as reference to implement an EditText background with a ripple on the line. The MaterialEditTextBackgroundDrawable is made to behave just the same as the framework XML implementation of EditText background, so that a drop-in replacement should not affect your layout and alignment. For simplicity of usage, a MaterialEditText is created to set the background automatically, and set the hotspot of ripple on platforms prior to Lollipop. The InputTextLayout from Design Support Library can automatically set the red tint on background when an error is set. An MaterialInputTextLayout is introduced to make the background drawable show a bold red line consistent with Material Design Guideline when an error is set. Simply replace your EditText with MaterialEditText and TextInputLayout with MaterialTextInputLayout, then you can enjoy the delightful detail now. The AAR of this library has already included a ProGuard configuration file to make ObjectAnimator work properly. Neither Support v4 nor AppCompat v7 backported animation API to versions prior to ICS, and the NineOldAndroids library has already been deprecated since people should all be using minSdkVersion="14" now, so versions older than ICS are not supported.